This is a 1982 HUTCH XL24. From what i’ve been told be hutch collectors, this is a really rare bird. It was made by PROFILE for HUTCH. It has what they call is a “double stamp brake bridge”. Thus meaning it is stamped HUTCH on the top and bottom of the brake caliper bridge. In my own words, I dont think welders paid attention to detail in the early 80’s. Remembering the writing faces outward?? Sounds like hungover or still listening to disco or something. lol….I scored it on eBay on a after sale. Nobody bid on it, so i offered up some greenbacks, he took it. I had the frame delivered from Texas to California & low and behold i see the mythical creature. I was so stoked !!! As you see it here today, I am still collecting period correct items. Anything with the Hutch name on it will empty your wallet, especially the important parts. 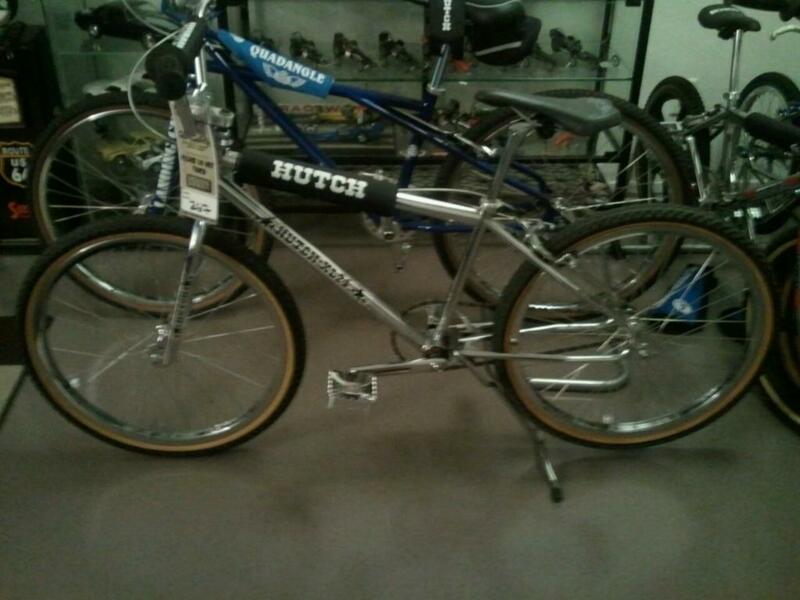 Im on the lookout for hutch aerospeed cranks, Hutch titanium (unobtainium lol) hubs, and Hutch cruiser bars. I have the bike built to ride, but once you reach this area it becomes another level of collecting which i am daring myself to enter. At the last show I was at, I was asked by one collector when am i going to build it. I said it’s built, then he repeated what he said. Now i know what he meant.